--TE Andrew Quarless is the sixth Penn State football player to be suspended this offseason, joining DTs Chris Baker and Phil Taylor, LB Navorro Bowman, DB Knowledge Timmons, and WR Chris Bell. This wouldn't be happening if Bill Cowher was in charge. --King Pryor's Jeannette Jayhawks won their second-round PIAA playoff game against Girard, 67-35. Your royal highness led Jeannette with 16 points. --Bracketologist Joe Lunardi says Pitt is a shoo-in for the tournament. He has to be right. He's got a degree in it, for crying out loud. --Marian Hossa "really hopes" to play on Sunday against the Capitals. --Anyone care what Lloyd McClendon thinks about the Pirates these days? --The Buccos are placing a ticket limit of eight per person for the home series against the Yankees. Don't forget to wear your Wang hat. --In addition to Dolphins OL Rex Hadnot, LB/special teamer Tracy White of the Packers stopped in for a visit with the Steelers, and both left without contracts. --Mt. 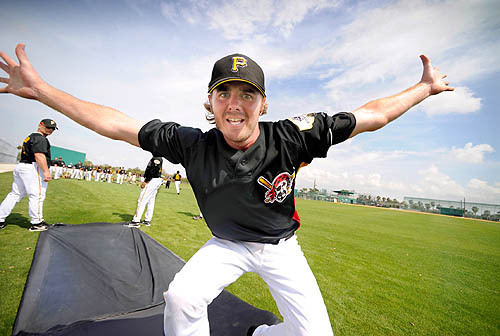 Lebanon's Josh Wilson looks like he's enjoying Pirates training camp waaay too much. --The Duquesne Dukes fell to Temple, 90-85. That's five Ls in a row for the Fighting Everharts. --Former Phoenix Sun Kevin Johnson is running for Mayor of Sacramento. --Patrick Swayze has quite an uphill battle with cancer on his hands. --To close, some big news courtesy of SOJ: there's a nightclub in Johnstown again. Is that pic from hotchickswithdouchebags.com? If not, it should be. We need to get GwenJen back on here or something because the commenting has been dying a slow death.